He is the winner of all 4 Grand slams, and it seems that there is not much that will keep him from winning more feathers for his Cap. 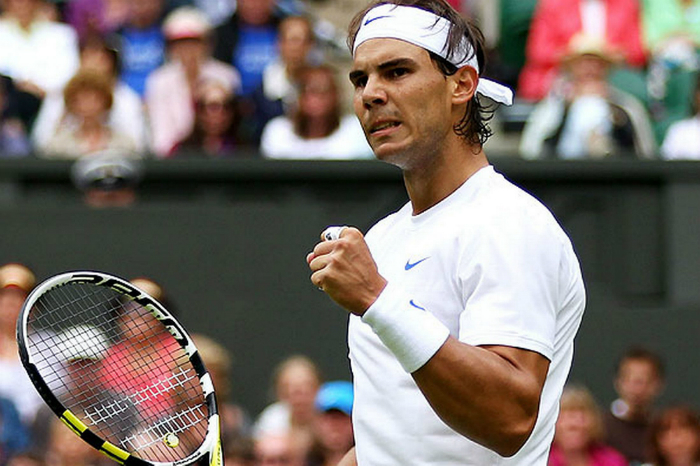 At the age of 28, Rafael Nadal has already etched his name in the rock of tennis history and perhaps in the list of exceptional sportsmen that the world could possibly have produced. While in court, his energy seems inexhaustible and his prowess remains almost unparalleled. As goes for his musculature which has been drawing a lot of attention from his fans all over the world, drop-dead awe-inspiring gorgeous would only be too little to express the entirety of the effect. For the ones who wish to satiate their curiosity about how Nadal manages to remain in such top shape, taking a sneak peek at his training and diet schedule can a helpful. Tennis is one of those racquet sports where almost every muscle group of the body is engaged and calls for extreme fitness levels to master the sport. Considering the fact that this genius remains engaged all through the year playing championship tournaments at different courts, his fitness remains intact without him having to try too hard. His training schedule is basically divided well between improving his finesse in the sport and a multilevel fitness training that grants him his near-Godly endurance levels. As far as the basic inclusions in his fitness program are concerned, Rafael has been seen to commence his schedule with the vibrating power plate which bestows multiple benefits including improved blood circulation, enhanced flexibility, muscle strength, enhancement of bone mineral density and most importantly, reduced body pain, soreness and faster recovery from damages. He has also shown his inclination towards the multiple advantages of using resistance bands. In fact, he prefers resistance bands to free weights and believes that its effectiveness is greater for sportsmen who are engage with joint taxing activities. Besides this, he focuses on core body workout including multiple exercises like front bends, pushups, pull-ups, planks, medicine ball workouts and multiple stretches. Rafael Nadal has revealed to the world, his love for chocolates and the fact that he gorges on them as often as he can. However, the nature of his tournament schedule, training and practice is such that none of the calories remains stored in his system. He is thus, never too stressed with what has to go into his body, because almost anything burns out within a day’s time. However, he likes to eat well balanced healthy meals which include lean proteins, carbohydrates and essential nutrients. Fish with pasta and vegetables can be mentioned in this respect.